Los Angeles, CA - The Afrolicious Hair & Beauty Expo is coming to the Los Angeles Convention Center on November 5th, 2017. This will be the last stop of a 4 City 2017 tour that stopped in Oakland, Houston and Brooklyn this year. 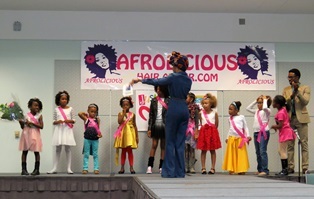 The Afrolicious Expo educates and demonstrates natural hair and celebrates Black Beauty with a $1000 Rastafri/Kanekalon hair stylist competition, local hair salon demos, 2 fashion shows and the Little Miss Afrolicious Pageant for girls 5 to 12. After 5 successful shows in Los Angeles, the founder (Rhonda Ray) decided to do a tour with the show and had great success with natural hair women in different cities wanting to come together and not only celebrate their beauty but share different hair and beauty techniques. This year, the show will be adding to the fun with a Soul Train Line contest. Afrolicious Hair will also be launching their new hair care products on November 5th at the Afrolicious Hair Expo LA. Their mission of celebrating Black Beauty through education and positive imagery remain strong and they are proud to continue as they travel from city to city showing the world the beauty of Natural Hair.